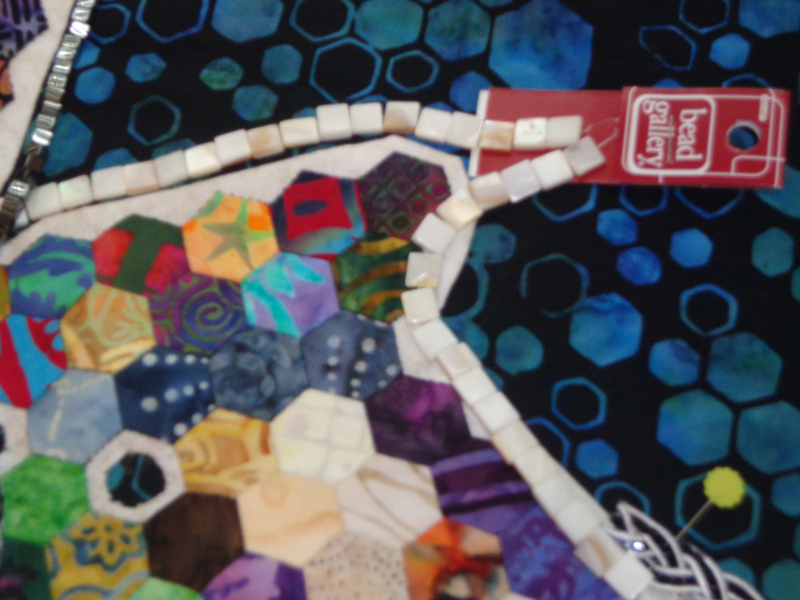 Since this is on the “finish a long list” I am trying to accelerate my thinking about this quilt that frankly needs to sit in time out for a while. 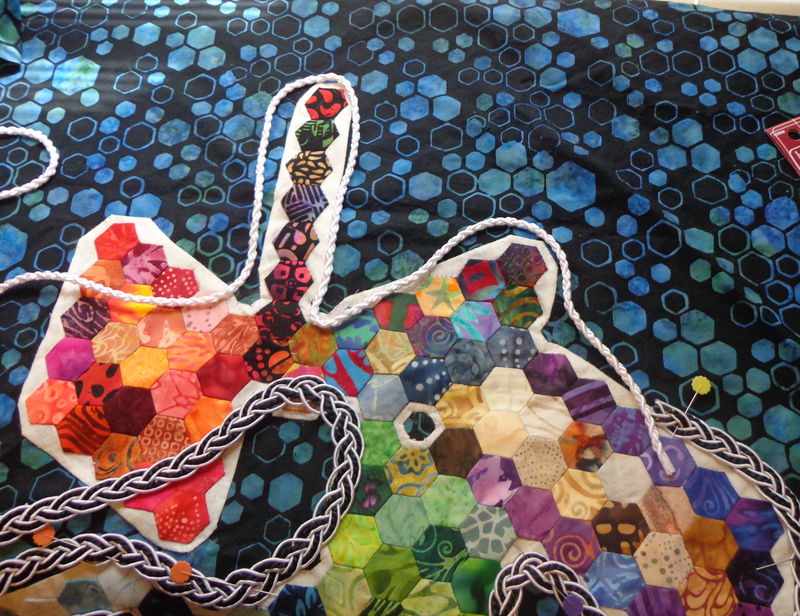 My Periodic Table – Periodic Spiral quilt to be more exact. This is going to be the future quilt’s location. Now all the white is needleturned (glued first) and now I have to decide if I like it. I am not a fan of needle turn as I never seem to get the best line of stitching as I can when I glue over freezer paper. However, putting the quilt up here made me think a few things. 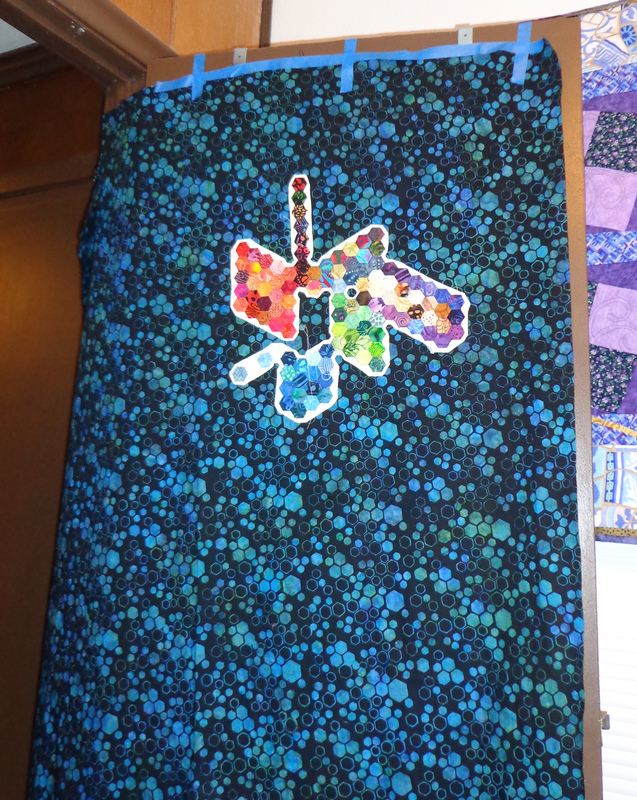 I want the words “The Periodic Spiral” to hover above the quilt. I think I want an explanation of the groups down below done in embroidery. I want something to block the needleturn edges from the background. Some kind of trim, embroidery or something. While I was at Hancock fabrics the other day I was looking for some multicolored ric rac or similar. 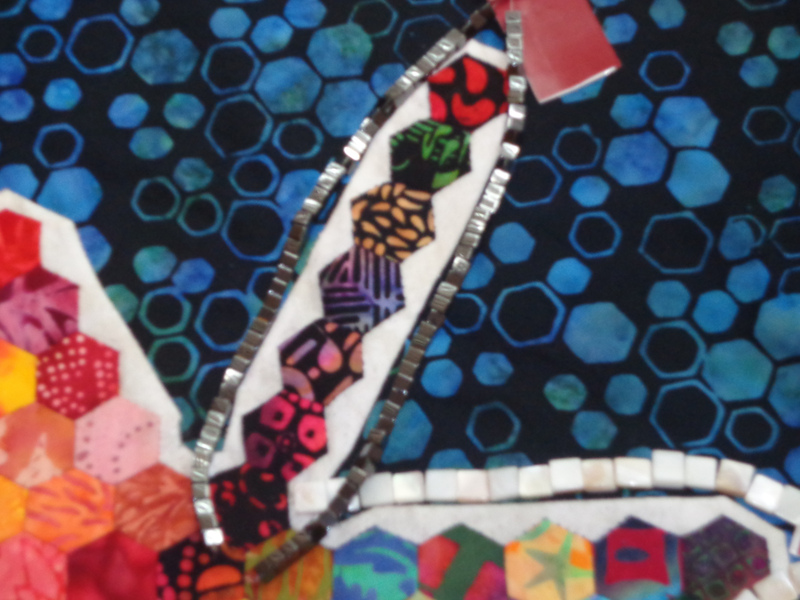 But I found some interesting black or white or black and white trims. I bought some black ric rac that in 2 days I have already misplaced somewhere. But this intriguing black and white braid, which I like love, but is a little thick, and really doesn’t navigate around the curves all that well. But I worry with this trim that it either takes away too much or detracts too much from the original design. It completely flows around the design. And then yesterday while at Micheal’s I was looking at beads. So I thought of these metal based beads. And then the opal ones. And I saw some carbon looking beads too thinking of how maybe I could get some different types of things to represent the different types of elements on the table, non metal beads, metal beads, something to represent gas forms, liquids. Head spinning, but only purchased the small square metal looking beads, but didn’t get enough to go around the entire design. Even if I add the opal ones together. And then there’s another white based cording that I was considering outlining a darker area that I would do the embroidery on. I bought some silver pearl cotton 5 floss and see the potential for twilling (our area’s hot hot hot embroidery design with knots) the types of elements. But I am trying to preview this on the entire design because I opted out of getting the black only cording for the missing black ric rac. And then there’s the lettering. Also while at Hancock’s I found some sparkly fabric. With optical illusions set against black. 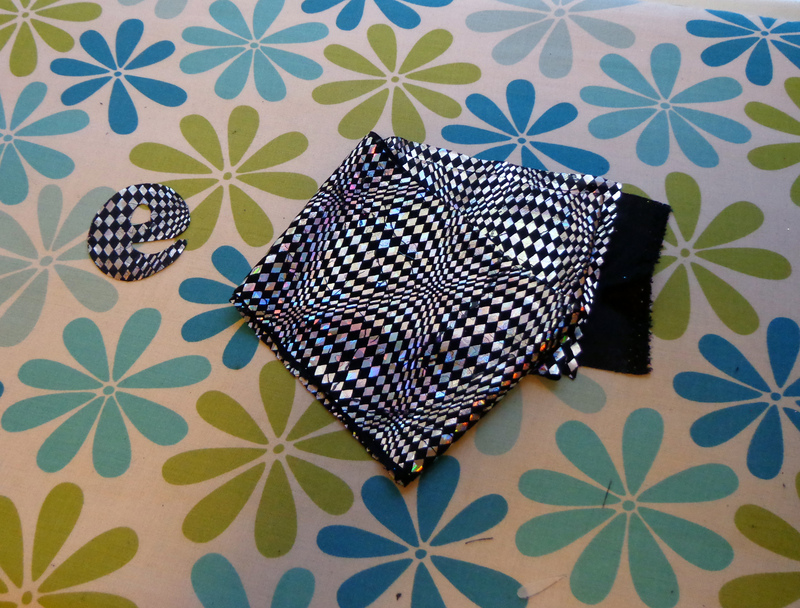 And you know I like optical illusions in quilts! so I cut out one letter in this shiny sparkly fabric. Problem with the letter is that I would also need a trim or something around the outside of the letter to separate the highly patterned letter from the highly patterned background. So I’m wondering if I starch the snot out of this slippery shiny sparkly fabric if there is anyway in the world I could make bias strips and outline a darker color of letter. Like make a black or dark blue letter with thin, shiny, sparkly bias tape edges. 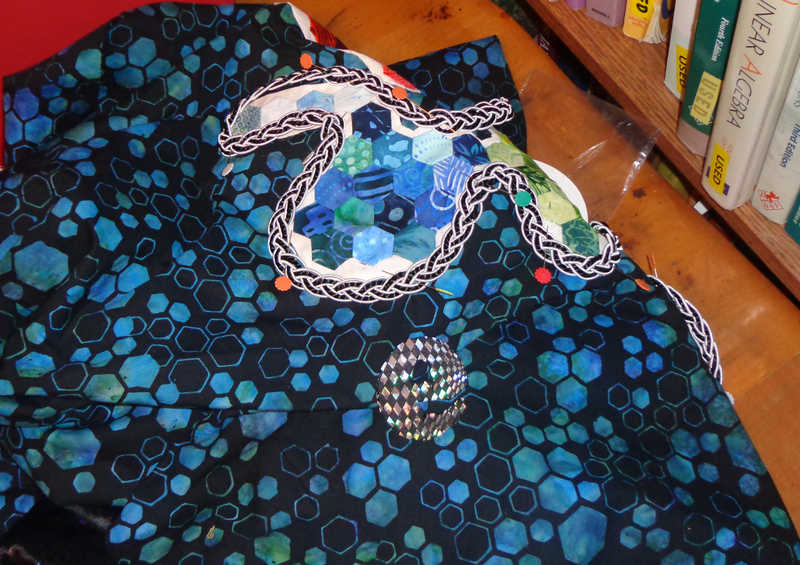 Or I could always bias around the edge of my periodic table with the sparkly fabric bias tape. Now there’s a thought. But honestly sounds like a lot of work. Wonder if I’m up to it. 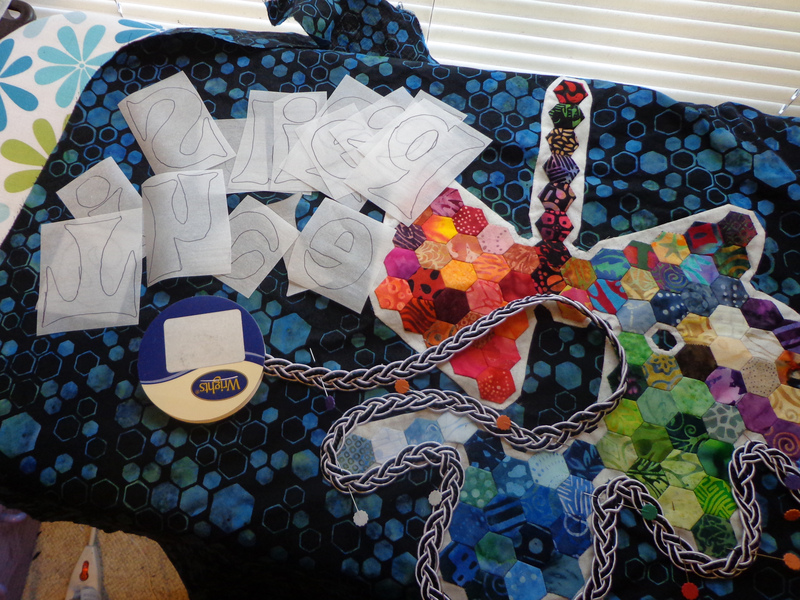 AND I still have to print out on fabric my “key” for the spiral to make it all make sense. How about if you did a satin stitch (maybe in white) around the optical illusion fabric letters? that might make the letters more distinctive. Darla, while I love the blue fabric, I think its a little too much for the background. Maybe as a wide border it would be better. I also think the black and white braid is too much. 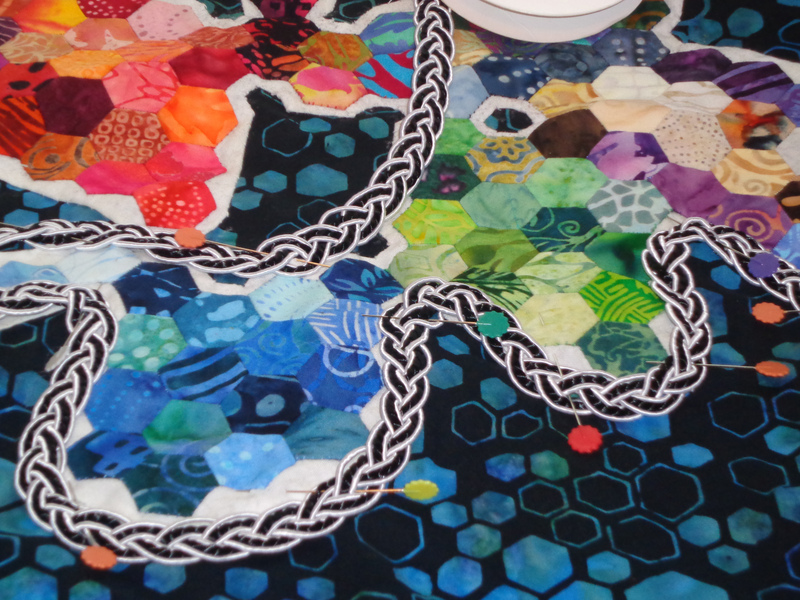 I do like the idea of the beads representing gases, liquids, metals, etc, but I would be cautious to keep them small so they don’t overwhelm the hexies. A needleturn tip: Use a Fabric Folding pen along the seam line or paint a small line of liquid starch on the seam line to help fold accurately. I love your ideas. It’s hard, sometimes, not to use them all, isn’t it? You have so many, you should write some down so you can use them on the next quilt.